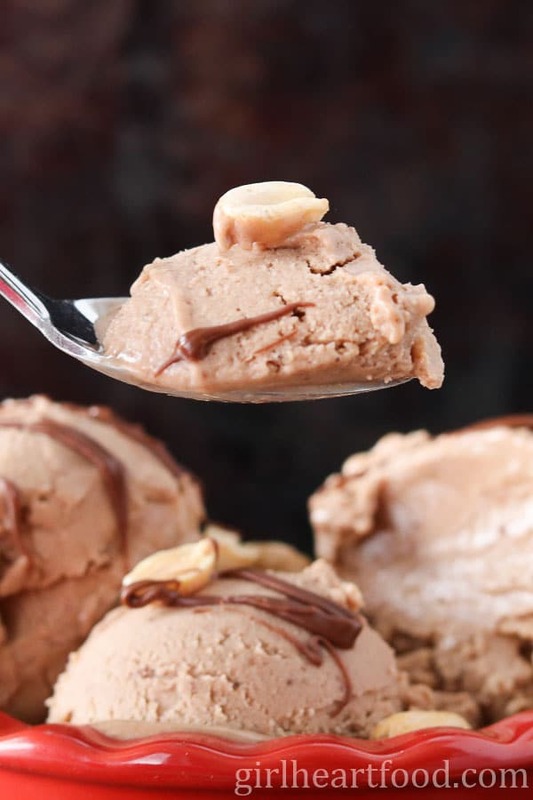 This Peanut Butter Nutella Banana Ice Cream ( try saying that 5 times, lol) is made with, get this, only four ingredients and couldn’t be simpler! Mix them up in a processor, freeze and enjoy! This ice cream with bananas is a delicious alternative to ice cream. Ice cream made with bananas? Yep! And it’s awesome! Sometimes I wonder why I buy bananas. It’s not that I don’t enjoy them. I go through periods where I eat them on the regular and then there are times when they sit on the counter until they practically walk away. It’s amazing how a frozen banana can transfer into ‘ice-cream’. When freezing bananas, ensure that they aren’t too ripe. If they are, your end result will be more ‘banana-ey’….not that that’s necessarily a bad thing, but you do want the other flavours to shine through…in this case peanut butter and Nutella. Prior to freezing, peel those bananas. Place a piece of wax paper on a baking sheet and cut your peeled banana up into chunks. This makes it easier on your food processor. Speaking of which, depending on the model/strength of your food processor, you may need to blend the bananas up in batches initially. When the nice cream is ready to freeze, I like to place in a wax paper lined baking pan. I do this so I don’t scrape the heck out of my pan when scooping up to enjoy. When you are ready to shove this nice cream into your pie hole, remove from the freezer for about 10 minutes to soften slightly and make it more scoop-able. Drizzle extra melted Nutella on top and sprinkle with peanuts for extra oomph when serving up. 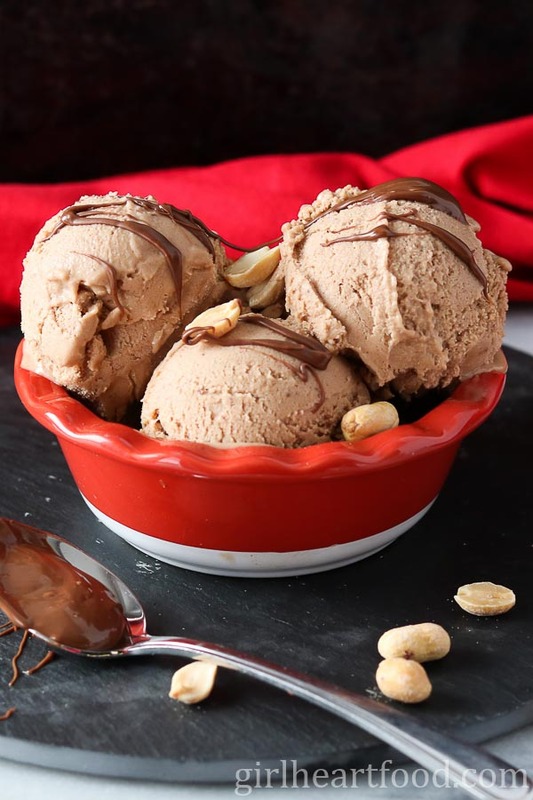 As my hubby says, this Peanut Butter Nutella Banana Ice Cream is a weekend treat without the Monday guilt 😉 Don’t know about you, but I am totally down with that! This Easy Peanut Butter Nutella Nice Cream is made with, get this, only four ingredients and couldn't be simpler! Mix them up in a processor, freeze and enjoy! A delicious alternative to ice cream. Place all ingredients in a food processor and blend until smooth, stopping to scrape sides with a spatula, as necessary. Place mixture in a parchment paper lined pan or dish or freeze for 2-3 hours. Upon serving, you can drizzle additional Nutella and sprinkle peanuts over top, if desired. Enjoy! To melt Nutella for drizzle garnish, place desired amount in microwave safe bowl and heat for 30 seconds at a time, until desired consistency is reached. Banana + nutella is SO delicious… and I love making banana “nice” cream! I got into a habit of making it a lot last summer, so I’m sure the banana ice cream bug will hit me again soon. Totally! It’s a favourite around here 🙂 Thanks Nicole! Hope you’re having an awesome week so far. Peanut butter banana nice cream is my absolute favourite! I definitely need to try it with the Nutella! I know, right?! So freakin’ good! Yes, the Nutella adds a little somethin’ somethin’ 😉 Thanks Leanne! Weekend treat? How about daily treat? If this is in my house, I’m eating every day! It’s practically guilt free! Haha! So true, Thao 😉 Thank you! Oh. My. This looks good! I think I just found my weekend dessert! That’s bananas! 🙂 I make homemade ice cream all the time (fun, right??) but I’ve never tried with bananas. We’re the same, sometimes we’re friends, other times they just sit there. I wonder why that is…Can’t wait to try this. We already have peanut butter and Nutella! So this is happening soon. Have a wonderful weekend! Haha – it sure is 😉 Hope you love this one, Jolina…I kinda think that you will 🙂 Happy Friday! Did you say healthy ice cream??? Serve me up a double scoop! Yep! Coming right up, Kathy 😉 Thanks! I’m an old-fashioned boy meaning I enjoy ice cream made with real cream and eggs. But I do enjoy banana ice cream quite often too. Besides being light but creamy and rich, it’s so versatile too! I totally love the idea of combining it with nutella and peanut butter – delicious! Oh – I do enjoy that too, but sometimes it’s nice to have a lighter version, ya know 😉 ? Hope you enjoy this one too, Ben! Thanks so much! This looks amazing! So excited to try your take on the recipe. I will definitely enjoy a bowl or two of this extra smooth ice-cream! And I think that your husband is right on in his description! I love it. Pinned! I think so too 😉 Thanks you Milena! Have a great weekend! That ice cream looks amazing. Anything with nutella gets a big thumbs up in our house! Thank you! Same here – that stuff is delish! What a decadent and perfect flavor combination. My family loves both peanut butter and Nutella. And summer calls for ice cream desserts so I am in with this one. I love that: “A weekend treat without the Monday guilt!” Hooray for that! I’m absolutely going to try this, Dawn! Some of my favorite flavors and truly the prettiest Nice Cream I’ve ever seen! Haha – right?! As soon as he said that, I was like ‘perfect – love it. You’re too kind, Marissa! Talk about a winning combo of flavors!! I used to have peanut butter, Nutella and banana sandwiches all the time!! This ice cream looks so delicious and easy to make. I can’t wait to see if it tastes as good as it looks!! I’ve never had in a sandwich form before, but bet it’s delicious! Thanks Elaine! Yay! It is a favourite around here, so hope you guys enjoy it too 🙂 Thanks Natanja! Oh my! I’ve been wanting to try “nice cream” for awhile now and I’m pretty sure this is the way to do it! 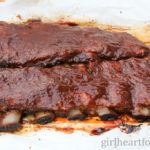 This recipe is amazing – my kids and I will be trying it this weekend! It sure is 😉 Thanks Lauren – hope you guys love it! I’ve only recently discovered nice cream and I LOVE IT! So far I’ve just made chocolate and peanut butter, but you know I’m trying this as soon as I get some bananas :). Anything Nutella is my favorite! Have a great weekend, Dawn! So yummy and crazy easy, isn’t it?! Can’t go wrong! Happy weekend, Kelsie! 4 ingredients? Hello! Next on my dessert list Dawn! All my favorite ingredients! Happy weekend love! Yay! So easy, right?! It sure is…something to look forward to after doing some work 😉 Have a great weekend!